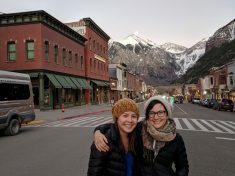 A few weeks ago, I packed up my car and headed west to Telluride for a series of meetings with members of the Colorado Network of Health Alliances. The long drive reminded me of all the beauty Colorado has to offer, but also how vastly different our communities can be—each region presenting its own set of resources and challenges. One thing I love about the Network is the countless opportunities we get to learn from one another. One of our first activities this trip was having each health alliance share with the group something (a tool, resource, program, strategy, etc.) that has been successful in their work, as well as any of the challenges they currently face. At first, I thought I had planned too much time on the agenda for this, but I definitely did not have anything to worry about there! Everyone was listening intently and asked great questions that revealed how their peers had been able to take their work to the next level or remove barriers that stood in their way. I saw many “aha moments” as alliance members discovered small changes they could implement to make their work more effective. Once the activity ended, conversations continued through lunch with exchanges of email addresses and calendar invites. While all of the health alliances focus on improving the health of their community through collaboration, the realities of their geographies, personalities, organizational structure, and priority areas could not be more diverse. They prioritize everything from health insurance enrollment to sexual health to safe housing. However, as they all shared their successes, I was once again reminded of the importance of listening to and learning from each other, in order to be more effective in our work and have more meaningful relationships in our lives. I know I don’t spend enough time around people whose lives, backgrounds, and perspectives are different from mine. If I did, I would certainly have more empathy for and relationships with some incredible people! As a field working on access to health care and health equity, we have done a lot of sticking to our own silos. Although I attend a wide variety of meetings focused on a huge range of health care issues, the other faces in the room don’t change much from meeting to meeting. While we all care about health and bring our own knowledge, skills, and perspectives to the table, it’s important that we seek out the knowledge, skills, and perspectives of those whose lives and backgrounds are different from our own. One important way to do that is listening to and taking direction from people who have lived experience in facing barriers to good health and health care. Another way is get out of our Denver bubble and learn from our communities around the state. Center for Health Progress is working on both of these. We’re listening to and learning from Coloradans who are facing unjust health inequities; these are the real leaders with their own resources, tools, and expertise. We’re also spending a lot of time in communities across Colorado. In addition to my travels for the Network, I have learned so much from the incredible work that our community organizers are doing in Fort Morgan and Pueblo. There is so much potential for shaping a Colorado where we can no longer predict someone’s health outcomes based on their race, income, or ZIP code, if only we’re willing to start listening.